CLICK to enlarge this overlay of modern Washington on the 1793 Ellicott topographic map that shows the dramatic changes to Tiber Creek and the Potomac and Anacostia rivers shorelines. Tiber Creek was covered over in the 19th century with Constitution Avenue. The Lincoln Memorial and Jefferson Memorial are located on landfill in what was originally the Potomac River. The most serious and growing environmental threat to the National Mall — and our nation’s capital — is flooding. Read the recent eye-opening article here. In fact, the Mall area is threatened by two separate flood problems: Potomac River overflow and stormwater flooding caused by surface water runoff from higher city elevations to low-lying Constitution Avenue where historic Tiber Creek is buried, as diagrammed at left. Climate change is expected to increase in frequency and intensity the threat from both river and stormwater flooding, as well as add new stress to the Mall turf grass, soils, and trees. Taking action to solve these serious environmental problems should be a priority. While a new levee at Constitution Avenue and 17th Street is now is place to prevent Potomac River flooding into Downtown DC, there is no plan or policy in place to address the separate stormwater flooding threat to Mall area museums and public buildings such as the flood that devastated the Mall area in 2006, as ilustrated at right. One innovative, multi-purpose solution we have proposed, building on government studies that propose an under-the-Mall flood cistern, is the National Mall Underground project. Review the flooding problem in greater depth on our Research page here and in this Photo Gallery slide show. To ensure preservation of the historic concepts and character of the Mall while also responding to climate change and to modern needs for intensive public use, the Mall needs an updated, scientifically-based plan for its landscape elements which have not been evaluated and updated for many years. This is a critical missing link in all Mall planning. 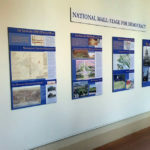 The National Park Service’s National Mall Plan does not take into full consideration the quality of the Mall as the legacy of historic plans, a work of civic art, and a symbol in architecture and landscape of American history and identity. NPS managers are not planners. NPS has been acting as custodians whose primary concerns are maintenance of the status quo. Today the Mall needs much more. Important topics for study include use of under-tree areas for public use — to accommodate the Smithsonian Folklife Festival and other popular cultural events — and permeable paving. Current NPS policies reject use of under-tree areas and any improvements to support such use, despite the proven success of such improvements in urban areas around the country and the world. Instead, to protect the grass and tree roots NPS is increasingly denying public use permits and thus reducing the vitality of the Mall. There is a need to create an independent task force to do full and updated landscape evaluation and plan for the National Mall that both protects the landscape and supports public use. Protect the integrity of the historic legacy that give the Mall its symbolic and design unity. Congress in the Commemorative Works Act has given direction in this regard to “preserve the integrity of the historic L’Enfant and McMillan plans” that are the blueprints for the Mall. Support the artistic unity of the Mall’s marriage of architecture and landscape. Historically, the rows of elm trees were designed as part of the overall artistic composition to provide an “architectural” frame for the Mall’s broad greensward and vista as well as a continuous shaded promenade for visitors during Washington’s hot summer months. Artists, architects, and landscape architects should be actively involved in any and all modifications of the landscape composition, horticulture, and walkways and other surfaces. Apply the best science-based, sustainable solutions to support public use of this popular and much-used public open space. Executive Order 13514 for sustainable planning and cost-effective choices should guide planning. If properly retrofitted using the latest science and sustainable solutions, and with clear public use policies put in place, the areas under the elms could not only accommodate current use but support the inevitable growing activities. Ultimately, the Mall landscape should be a model of the most forward-thinking sustainable thinking and practices. Anticipate in all aspects of landscape planning the challenges of climate change. Recognizing the need for water for beauty as well as refreshment in Washington’s torrid summers, and admiring of European gardens such as the Tuileries in Paris, both L’Enfant and the McMillan Commission designed the Mall to have plentiful water elements, most of which have never been fully implemented. With the growing effects of climate change, creating refreshing water features for future visitors to the Mall will be more important than ever. In his 1791 plan, L’Enfant called for Tiber Creek to create a “Grand Cascade” waterfall descending from Capitol Hill to the Mall where it then would be channeled into a canal along the Mall’s norther boundary. The 1902 McMillan Plan featured a medley of pools and fountains at the Washington Monument and Versailles-inspired fountains in the Lincoln Memorial Reflecting Pool. L’Enfant’s canal was paved over with Constitution Avenue in the 19th century. Most of the McMillan water elements were never built. The lack of intended pools and fountains on the Mall diminishes the beauty of the landscape and leaves visitors parched and desperate for cooling water. There should be created a plan to add water elements, perhaps as part of a comprehensive sustainability plan for the Mall. The National Park Service’s current National Mall Plan, which discourages water elements as expensive to build and maintain, should be amended to accept them.